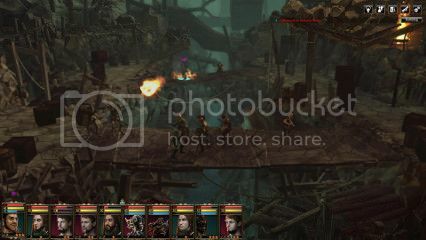 While I only recently picked up Blackguards and haven’t had a chance to put aside the time for it, I have had a chance to take a look at Blackguards 2. I’ve heard that the first game is quite unforgiving in how you develop your characters and that seems to be the case with this one too but, after that first hurdle of getting through ridiculously difficult missions early on (missions 4 and 5), everything simmers down to a realistically set difficulty. I’ve played the first 16-20 battles and quite frankly, I love it. The early story seems a little wishy-washy, as it tries to dive in at the deep end, where little makes sense to anyone unfamiliar with the previous game. It did however get past this after I reached the world map as it let you delve into the story further; probing characters for information on what interested me most and letting me piece things together more easily. I particularly like how dark the story is. It’s uncommon for games to have a protagonist which is quite as flat out insane and erring towards an evil nature. Cassia (the main character) is both mad and driven by revenge of a sort that she herself doesn’t really understand. The decisions that I got to make with her always seem as though they alter the scenarios I came to face. Depending on how I treated prisoners, I was able to either get more information/better circumstances or get completely shut down and left to deal with a trap/loss of a bonus. The combat has been improved vastly if the preview guide is anything to go by. Spells will now always cast, forgoing the dice roles from the Pen and Paper game and allowing you to use mages with more freedom; though this does also mean that enemies are given the same treatment. Energy has been added as well, allowing you to use combat skills often but with the need to replenish the resource every now and then. Also, the ability to check hit chance for ranged weapons before moving to the space you’re think of moving to is incredibly useful. As I mentioned there are a few very difficult missions; they’re difficult mainly because the expectations don’t match the opportunities for character progression and equipment you’ve been given early on. For example: mission 4 sees you in an arena as Cassia alongside her interpreter. She has to fight a minimum of three waves – which does include a tiger – but you also take two damage at the end of every turn. It took about 6-8 attempts before I actually managed to get past it. That included restarting from the beginning twice. My original attempt favoured bows for Cassia but you only get five arrows to begin with, and don’t seem to be able to find any more until later in the game. 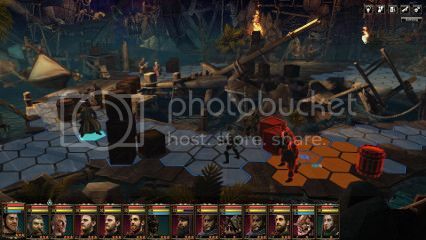 The second hurdle for me was the mission directly afterwards, that has your party outnumbered and on the run. Again it took me another restart to get through this, as I hadn’t prioritised and equipped everyone sufficiently to get through. What made things worse was the seemingly arbitrary game over I received twice for what I can only assume was me taking too long to escape. Those two sole instances were the only real hurdles I’ve come across, in normal difficulty at least. The other missions have been challenging at times but once I’d learnt to more appropriately level my characters, they filled their respective roles nicely and it’s been easier to manage groups of enemies which I couldn’t early on. Even when I make atrocious decisions, the fact that characters can either be revived or left to retreat from the battlefield (instead of dying), meant that I could take chances and not have to lose a character permanently; which is something tactics games often have, and leads to “safer”, stale ways of playing. 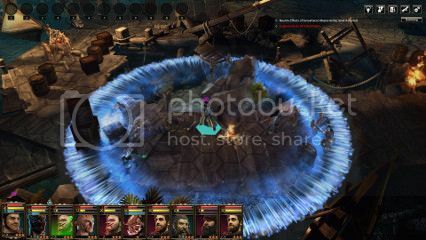 It means that when I’ve cast a fireball that engulfs one of my party members alongside several enemies, I can take the chance that he’ll be overwhelmed and knocked out of the battle but get a significant edge on them for doing so. The world map is probably my favourite bit, if only for the fact that I can dictate which missions I do when – even if only to a certain extent. With each area having specific unlocks for your mercenaries, camp and/or story, it gives me plenty to plan out as I decide which troops I want to buff first. The only hitch to that in this build is the lack of the difficulty notation on an area. I have had to revert to slightly earlier saves and occasionally get by after multiple attempts and by the skin of my teeth. Obviously this is completely different to the difficult early missions as with these it’s only the current build lacking a minor detail rather than a lack of opportunity to prepare myself. Just to reiterate, I’m really enjoying the direction the game has taken. Before getting past those early hurdles I was almost ready to write it off but it’s been really worthwhile me persevering to get to the point I am now, having exhausted all the of the battles bar one which is currently bugged for me. Unsurprisingly I’m now really looking forward to the release next year; if the pacing and story manage to keep at the level it’s gotten to then it could be an incredibly worthwhile sequel.